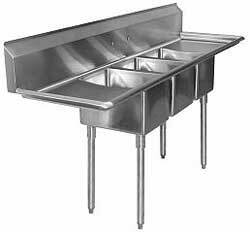 Aero Stainless steel sink with 3 bowls, 2 drainboards. 90.5" Overall length. Bowl sizes are 18 X 18 X 12-inches deep. All 18 gauge stainless construction with galvanized legs. Made in the U.S.A. NSF. For a limited time, 3 sink drains are included. The Krowne Heavy Duty Faucet is recommended with this sink (not included). Aero has a long history of manufacturing quality food service equipment for full service restaurants, restaurant consultants, quick serve restaurants, convenience stores, hotels, kiosks, schools and stadiums.